Many of the older piers along the Southern California coast have either fallen away, or been converted to places to buy a taco or cast for shore fish. This is a newer, working pier, designed for the pickup and transport of workers from the oil rigs in the Santa Barbara Channel. 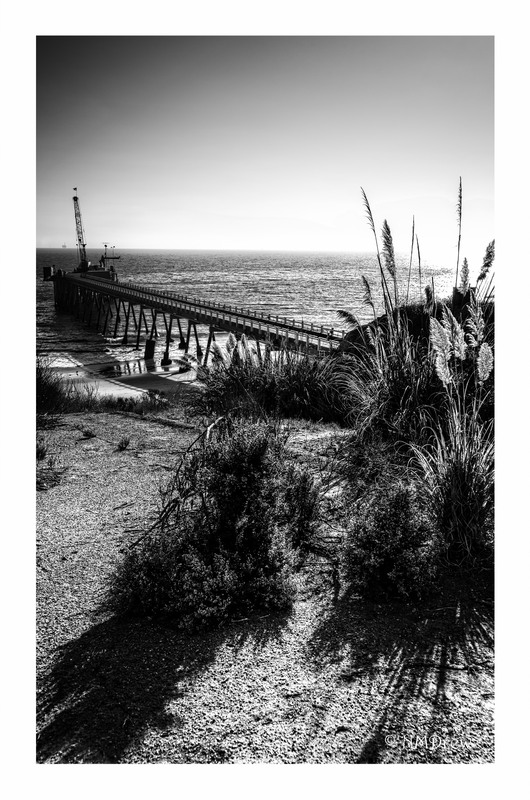 This entry was posted in Glimpses and tagged b&n Nikon Df, black, BW, California, Nikon 24-85mm f2.8-4, oil rig, photography, pier, sunset, white. Bookmark the permalink. Thanks! And good morning to she who is thousands of miles away across the sea! Thanks for the afternoon greeting – accidently trashed it! But I did get it . . . isn’t amazing that we can sit here and chat or text across continents and oceans??! !